skimage.transform.hough_ellipse(img[, …]) Perform an elliptical Hough transform. skimage.transform.hough_line(img[, theta]) Perform a straight line Hough transform. skimage.transform.integral_image(img) Integral image / summed area table. skimage.transform.integrate(ii, start, end, …) Use an integral image to integrate over a given window. 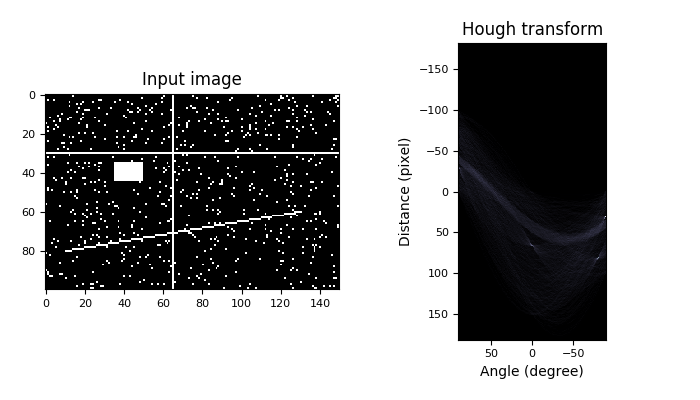 skimage.transform.probabilistic_hough_line(img) Return lines from a progressive probabilistic line Hough transform. skimage.transform.seam_carve(img, …[, …]) Carve vertical or horizontal seams off an image. The FRT has a unique inverse if and only if n is prime. See [R481] for an overview. The idea for this algorithm is due to Vlad Negnevitski. [R482] F.C. Crow, “Summed-area tables for texture mapping,” ACM SIGGRAPH Computer Graphics, vol. 18, 1984, pp. 207-212. For backward compatibility with versions prior to 0.12. The earlier function signature was integrate(ii, r0, c0, r1, c1) , where r0 , c0 are int(lists) specifying start coordinates of window(s) to be integrated and r1 , c1 the end coordinates. Assume the reconstructed image is zero outside the inscribed circle. Also changes the default output_size to match the behaviour of radon called with circle=True. The default behavior (None) is equivalent to False. [R483] AC Kak, M Slaney, “Principles of Computerized Tomographic Imaging”, IEEE Press 1988. [R485] AC Kak, M Slaney, “Principles of Computerized Tomographic Imaging”, IEEE Press 1988. [R488] Kohler, T. “A projection access scheme for iterative reconstruction based on the golden section.” Nuclear Science Symposium Conference Record, 2004 IEEE. Vol. 6. IEEE, 2004. [R490] Kohler, T. “A projection access scheme for iterative reconstruction based on the golden section.” Nuclear Science Symposium Conference Record, 2004 IEEE. Vol. 6. IEEE, 2004. [R491] Winkelmann, Stefanie, et al. “An optimal radial profile order based on the Golden Ratio for time-resolved MRI.” Medical Imaging, IEEE Transactions on 26.1 (2007): 68-76. Maximum gap between pixels to still form a line. Increase the parameter to merge broken lines more aggresively. [R492] C. Galamhos, J. Matas and J. Kittler, “Progressive probabilistic Hough transform for line detection”, in IEEE Computer Society Conference on Computer Vision and Pattern Recognition, 1999. Assume image is zero outside the inscribed circle, making the width of each projection (the first dimension of the sinogram) equal to min(image.shape). The default behavior (None) is equivalent to False. [R498] AC Kak, M Slaney, “Principles of Computerized Tomographic Imaging”, IEEE Press 1988. Performs interpolation to upscale or down-scale images. For down-sampling N-dimensional images with integer factors by applying a function or the arithmetic mean, see skimage.measure.block_reduce and skimage.transform.downscale_local_mean , respectively. Scale factors. Separate scale factors can be defined as (row_scale, col_scale) . Points outside the boundaries of the input are filled according to the given mode. Modes match the behaviour of numpy.pad . The default mode is ‘constant’. Whether to keep the original range of values. Otherwise, the input image is converted according to the conventions of img_as_float . Performs interpolation to up-size or down-size images. For down-sampling N-dimensional images by applying a function or the arithmetic mean, see skimage.measure.block_reduce and skimage.transform.downscale_local_mean , respectively. Size of the generated output image (rows, cols[, dim]) . If dim is not provided, the number of channels is preserved. In case the number of input channels does not equal the number of output channels a 3-dimensional interpolation is applied. The rotation center. If center=None, the image is rotated around its center, i.e. center=(rows / 2 - 0.5, cols / 2 - 0.5). Carve vertical or horizontal seams off an image. Carves out vertical/horizontal seams from an image while using the given energy map to decide the importance of each pixel. Input image whose seams are to be removed. The array to decide the importance of each pixel. The higher the value corresponding to a pixel, the more the algorithm will try to keep it in the image. Indicates whether seams are to be removed vertically or horizontally. Removing seams horizontally will decrease the height whereas removing vertically will decrease the width. Number of seams are to be removed. The number of pixels in the right, left and bottom end of the image to be excluded from being considered for a seam. This is important as certain filters just ignore image boundaries and set them to 0 . By default border is set to 1 . If set, the image and energy_map are copied before being used by the method which modifies it in place. Set this to False if the original image and the energy map are no longer needed after this opetration. The cropped image with the seams removed. params ((3, 3) array) Homogeneous transformation matrix. [R501] Hartley, Richard, and Andrew Zisserman. Multiple view geometry in computer vision. Cambridge university press, 2003.
params ((3, 3) array) Essential matrix. [R502] Hartley, Richard, and Andrew Zisserman. Multiple view geometry in computer vision. Cambridge university press, 2003.
params ((3, 3) array) Fundamental matrix. affines (list of AffineTransform objects) Affine transformations for each triangle in the mesh. inverse_affines (list of AffineTransform objects) Inverse affine transformations for each triangle in the mesh. params ((2, N) array) Polynomial coefficients where N * 2 = (order + 1) * (order + 2) . So, a_ji is defined in params[0, :] and b_ji in params[1, :] .